I had my (full, 3 day) ticket a month ahead of time. In fact, we had things planned a month ahead of time, but there were some inadvertant glitches (not the traffic, nor busts, btw) that nearly derailed things. I still have my Saturday & Sunday tix ,laminated in plastic as of 1970. Friday’s ticket was tossed into a thicket along 17B, when our attempt to get in that night failed We paused to consider logistics, & I just tossed it into the underbrush. Well, THAT one IS a lost part of history 🙂 I still thought I would need it – word hadn’t yet trickled back to us that the concert was, in fact, free by then. What was fortunate was the fact that we had made it up there on Friday, before the Thruway had closed down – being in a position to at least hang out & try again early next morn. It may well go down as the slowest traffic jam in history, but, I can say it sure was the most colorful, musical, & festive one too. Thank you, thank you, all you funny DIY car & van artists ; you really brought a lot of smiles to my face. 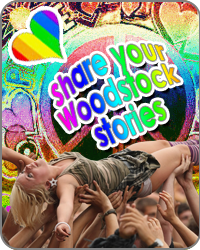 I have yet to write the whole, wall-to-wall Woodstock story, which I can easily do, & partially have. More like I somewhat ignored the subject over time, until it has become such an important, important symbol, as it is so much needed in these 2011 days, dark, dark atmosphere. With a life event like this one, tho, I think it’s more an “I’ll never forget” idea, & many who were there would likely agree! I do have a 3 pg. (postmarked & dated) letter I wrote & sent off to my Sis on Thursday, Aug 21st, recounting a few things I literally didn’t recall in overall memory. It’s funny to read @ points, but, the real stuff is in there nevertheless. Well, that’s a 19 yr old amateur for ya – who’s perfect? After setting out early Sat. morn, then having to park the car & walk along the highway for what felt like some 10 miles/2 hours, we finally walked up the winding approach roads, to view what was one of the most amazing sights I think I will ever see in this life. I guess many attendees have their “when I first saw that crowd” reactions – I can try to recapture mine. It was, at first, a victorious, proud kind of feeling of: “Yeaaahhh….I knew it might get this big, was hoping it would get this big” ; the feeling of a (definitely amateur) longhair’s relief & triumph at seeing how (unexpectedly!) huge this generational set of ideas had come in a few short years since, say, 1965…how huge that feeling-tone was getting….anyone who was there might will recognize this glow of ‘membership’ (cost free, too) in something that never had actually happened before, & certainly had never been powered by music & new artforms to that extent. I don’t, to this day, consider this impression at all naive. I feel that there was a fork in the human road which could have branched off & succeeded in what people were pushing for, for greater & greater freedom(s), & greater humanity brought out in the whole world. I was looking at a phenomenon. There really was a Group Mind acting in unison, under the surface. (And the MUSIC…wouw!) An early, Inner version of the internet was moving that crowd. For those who weren’t born yet, or too young @ the time, what that song phase says really was true – that “Something in the Air” was not in the least bit imaginary. This miles-thick psychological atmosphere of newness, freedom-to-come, freedom-finally-arrived optimism was so thick that one could just about taste it, cut it with a knife, bounce it over to other, ordinary kids just like you & anywhere you might go. And we did. And all this in spite of all the opposing negatives goin’ on. Some great psychological wavefront had been moving across the country, & at one heck of a rapid pace…a wave of joy & change that no one will – or could – ever put a price on. It was feeling that rode underneath appearances. I don’t think it can be recaptured, either (but I’d love to be proven wrong!) Makes me sad, real, real grief, that those who were around at that time know with (full) feeling what I’m getting at..& that is not to condescend in any way to anyone who wasn’t. It’s sincere – I wish I could transmit this one all over the place. (A lot of people do, I’d bet) The great grief is what happens when I begin to think that all this will be lost. It’s almost worse than losing someone close to you…it’s losing something bigger – maybe that IS worse. We left Sunday morn, just after the Who finished playing…& I did help pass around that brown trash bag to collect some trash. But – 24 hrs w’out sleep? I looked down @ the trash bag on (damp) ground that I had sat on all night, on the upper slope, &, well – no way – home & zzzzzzzz 4 me! I walked in my house door (folks away on vacation) around 11AM, plunked down my jacket, etc, & put a pillow in front of the stereo. (“unnnhhh..meee…sleeeeep” said the monster). Hit the stereo switch. First song to come on? “Can’t Find My Way Home” by Blind Faith. PS: Who put Iron Butterfly’s “Time of Our Lives” up on the PA System just after 12 noon on Saturday? Boy did that song say it all just then. The Sun came out that aft , too.